The first Formula One test of 2010 took place this week in Spain. It concluded yesterday, but Sebastien Buemi's steely gaze is already piercing deep into the heart of our wire service. Eye-popping gallery time! By and large, the test went well. A comprehensive wrap of the third and final day can be found here, but there isn't much to report. (Because there are so many variables in play — everything from fuel loads to outdated car components — testing is rarely a predictor of season performance or outright speed.) Ferrari dominated, with Fernando Alonso clocking the quickest lap of the final day. Driver lineups varied, and four drivers (Alonso, Button, Petrov, Alguersuari) climbed into a car they had never driven before. De la Rosa bumped wheels with Hulkenberg, prompting the marshals to break out the red flag. McLaren played around with something called aeropaint, and Michael Schumacher's test ended early due to a hydraulic problem. Thrilling stuff, right? 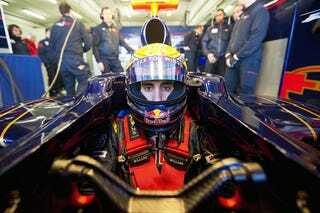 Testing resumes at Jerez on February 10th, and the first race of the season takes place at Bahrain on March 14th. Buemi's iron-man gaze, on the other hand, will be here all year.